Will Apple or Samsung have the best large phone of 2018? At long last the Samsung Galaxy Note 9 is official, which means we can start poring over its specs and design. We can also start comparing it against other phones, even if those phones aren't out yet – which in this particular case means the 2018 iPhone XL. According to the rumour mill, Apple is going to launch three iPhones in September, each with a different screen size and price. At the top of the pile will be the iPhone XL (if that is indeed its name), a 6.5-inch beast of a phone designed to go head-to-head with the Note 9. The Note 9 borrows heavily from the design language of the last few years of Galaxy phones – it looks a lot like the Galaxy Note 8 and the Galaxy S9 Plus, with a few refinements here and there. The screen size is a generous 6.4 inches. If we can believe the rumours about what's coming with the 2018 iPhone XL, Apple's biggest phone for this year will beat the size of the Note with a 6.5-inch display. The design will remain similar to the iPhone X, with slim bezels and a display notch. Both Samsung and Apple make some very well-designed phones, and it's going to be hard to separate these two devices on looks alone – unless you have a particular fondness for or dislike of the display notch up at the top. When it comes to specs, there's not much out there at the moment that can compete with what the Note 9 packs: it's carries an Exynos 9810 or Snapdragon 845 processor inside, depending on which country you buy it in, and the various configurations are going to go up to 8GB of RAM and 512GB of storage inside the phone. Apple doesn't really get involved in specs battles with other manufacturers – the iPhone X has just 3GB of RAM – but thanks to its hardware and software optimisations, top-end Apple handsets are always very, very quick. No doubt there will be another high-speed processor this year to follow the A11 Bionic from 2017. With the Apple phone not out yet, a head-to-head comparison in terms of specs isn't really possible, but both of these phones are going to be some of the best of the year in terms of performance – they'll be able to easily take everything you throw at them and then some. For a long time now the unique selling point of the Galaxy Note phones has been the S Pen stylus. This year the accessory gets a major upgrade, so you can control music, remotely operate the camera, and much more with the S Pen. Apple might introduce Apple Pencil support for the 2018 iPhone XL, but it would be a surprise. It would also be a surprise if Apple deviated much from the dual-lens 12MP+12MP camera on the rear of the iPhone X, while Samsung is going for a similar dual-lens 12MP+12MP setup on the Note 9. Like last year, these phones are set to be fairly evenly matched in their photo-taking capabilities, and both will have some of the best cameras in the business. As for other features, with waterproofing and wireless charging now standard across the board, there isn't much else that Samsung and Apple can add to the mix. One difference is that Apple has of course ditched Touch ID in favour of Face ID, whereas Samsung is sticking with fingerprint sensors as well as iris sensors. It's hard to split the Galaxy Note 9 and the 2018 iPhone XL – especially as one of these devices isn't even out yet. On paper, these two handsets are likely to be two of the best that 2018 has to offer, though we'll have to use them ourselves to be sure. As usual, the dealbreaker might be your choice between Android and iOS. If you prefer the Google mobile OS, go with the Note 9; if you prefer the Apple mobile OS, then the 2018 iPhone XL could be the best choice for you. In terms of everything else, from design to performance, it looks as though Samsung and Apple are going to be evenly matched this year. 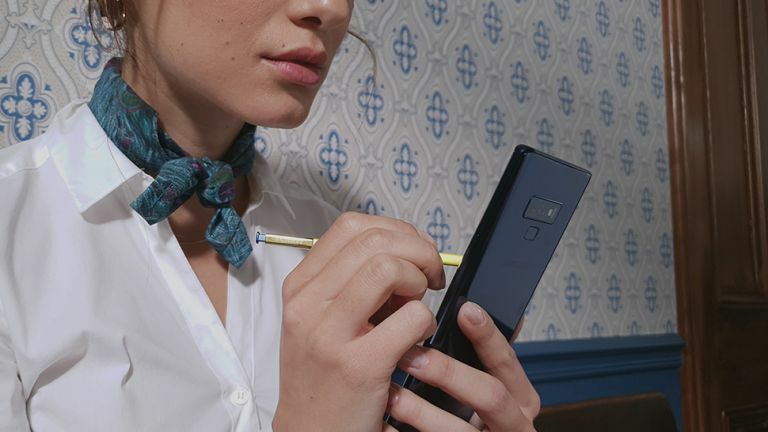 Don't forget the S Pen with the Note 9 though – giving you the option of a different kind of smartphone experience.